Vincent Addeo was initiated into Local Lodge 702, District 100, in 1980 when he began his career in aviation as an Aircraft Technician for Eastern Air Lines at their overhaul facility at Miami International Airport. In 1985, he transferred commercial air carriers to US Airways as a Line Maintenance Technician at Newark International Airport, Local Lodge 1445, District 141, where he retired in 2010 after a thirty-year career in aviation. During his time in the airline industry Vinny served as a Shop Steward, Grievance Committeeman, Local Committee Chairman, Flight Safety Representative, Employee Assistance Representative, and Recording Secretary for Local Lodge 1445 at Newark Airport. Vinny was recruited to work for the IAM Transportation Department in 1998 as a District Organizer where he served for seven years organizing in airline industry. In 2002, Vinny was appointed by the International President to serve on the IAM’s Blue Ribbon Commission, conducting town hall meetings with IAM members across the country. 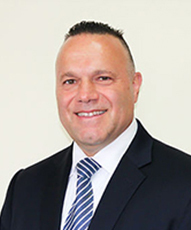 Vinny transferred to District 15 in Brooklyn, New York, in 2005, as the Director of Organizing/Business Representative for District 15, Local Lodge 447 where he served for thirteen years until being appointed by the International President to serve as the International’s Director of Organizing on January 1, 2018. Vinny also served as the President of the New Jersey State Council of Machinists for eight years, Executive Board Member of the Hudson County Central Labor Council, and Member of the Private Sector Lobbying Committee for the New Jersey State AFL-CIO. Vinny has been elected to serve as a Delegate to every Grand Lodge Convention since 1996. He also served his community in Hoboken, New Jersey, as an elected City Councilman and a Committee Member for the Democratic Party and was also elected by his community to serve as a Delegate to the 2016 Democratic National Convention held in Philadelphia. Vinny holds a Master of Science degree in Labor Studies – Union Leadership and Administration from the University of Massachusetts, Amherst, Massachusetts, and a Bachelor of Arts degree in Labor Studies – Union Leadership and Administration from the National Labor College, Silver Spring, Maryland. He is also a graduate of the Teterboro School of Aeronautics in Teterboro, New Jersey, where he received his Federal Aviation Administration Airframe and Powerplant Certifications and completed his Flight Training at the Pan Air Flying Club in Miami. Florida, where he received his Federal Aviation Administration Private Pilot Certification. Vinny is also a certified instructor for the National Safety Council. Vinny lives in Hoboken, New Jersey, with his wife Michele and together they are the proud parents of their son, Vincenzo, a student at Rutgers University and their daughter, Tessa, a student at Ramapo College.